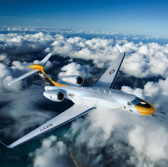 General Dynamics‘ Gulfstream Aerospace subsidiary has delivered a telemetry-tailored G550 aircraft to the U.S. Navy. The aircraft is built to work with a set of sensors to help the service branch in performing telemetry range support operations, Gulfstream said Thursday. The specialized G550 also features a cabin designed to provide a suitable operational environment for the aircraft’s crew. Raytheon received a contract in late 2017 to install the Commercial Aircraft Based Instrumentation Telemetry System and Airborne Command Transmitter System on the Navy’s G550 aircraft. Gulfstream has been manufacturing aircraft for over 50 years now, with more than 200 of its products supporting governments in 40 nations.